At the age of 77, George Thomas Smith had lost his wife of 53 years, but his daughter Audrey was still living with him, and played a large part in the rest of his life. His other surviving children were never very far away either. Family was all important to George, and he continued to be interested and involved in his children's lives. I don't know what impact the Great Depression of the 1930s had on him. All of his children who were farming at the time were hit hard, as southern Saskatchewan suffered extreme dry weather, dust storms and crop failures as well as economic recession. But they all stayed put and saw the trouble through. During his time as a widower, one more of his children passed away. George Jr died in April 1936, at the age of 54. 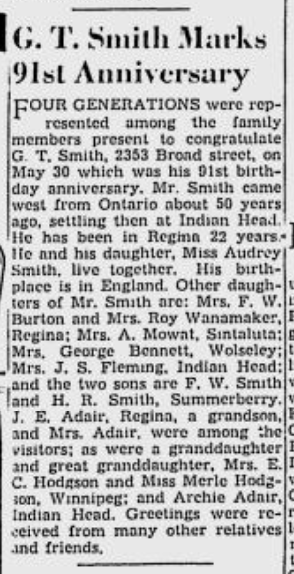 I haven't discovered his cause of death, but he died in the hospital in Regina, and no doubt his father and siblings were near him. Later that year, George and Audrey, along with Roy and Prue Wanamaker, drove to California for an extended holiday. 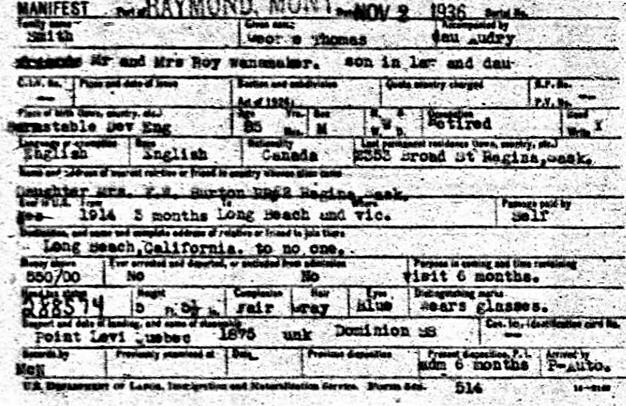 On the 2nd of November 1936, the four travellers crossed the US border at Raymond Montana, and were granted admission for six months. George gave their destination as Long Beach, California, and also said that he had been there before, in 1914. This is another of George's mysteries, as I can't find any other evidence of him being anywhere in the US at any time. 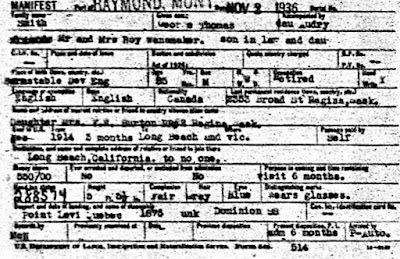 Not forgetting that in 1936 he was 85 years old, and might easily have got the earlier date wrong, maybe he, Louisa and Audrey were there in 1921, when they were missing from the Canadian census. George's border crossing document, Nov 2nd 1936. This is where I learned he had blue eyes. It's hard to read, but I think his height is stated as 5 feet 5 1/2 inches. Louisa was slightly shorter. But all of their sons were over 6 feet, and their daughters were generally tall too. I don't know how long the foursome stayed in the US, but I do know they spent some of their time there with Roy's aunt Mary McConnell and her husband Zedick Wright, who had lived in San Bernadino, California, for many years. Although they lived a long way off, it seems that they had close ties with their Canadian family and in-laws. 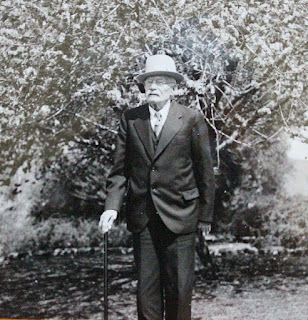 By this time, George was using a cane to help him walk (but he never called it that - it was his walking stick). His general health was still good though, despite the asthma that had plagued him for many years. And as the photos show, he was something of a snappy dresser. 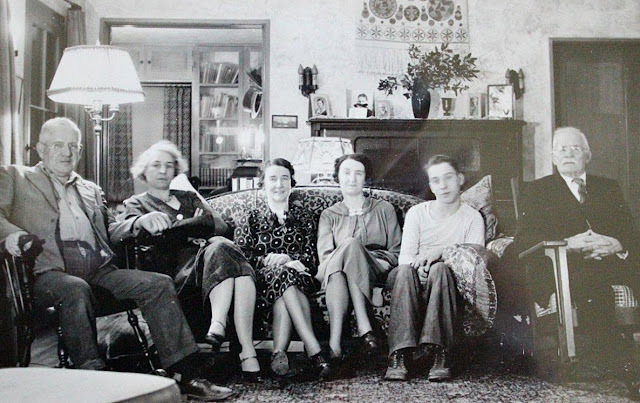 A few years later, in 1942, George's family threw a 91st birthday party for him. (It seems that there was no 90th birthday party - perhaps he had taken sick at the time.) He was always an outgoing person, and although he was becoming frail, he still enjoyed special occasions and gatherings of family and friends. George was buried in the family plot in the Regina cemetery, where Louisa and George Jr had preceded him, and Audrey would follow. A page from Donna Smith's scrapbook, showing the Smith family plot in the Regina cemetery at Broad St and 4th Ave. 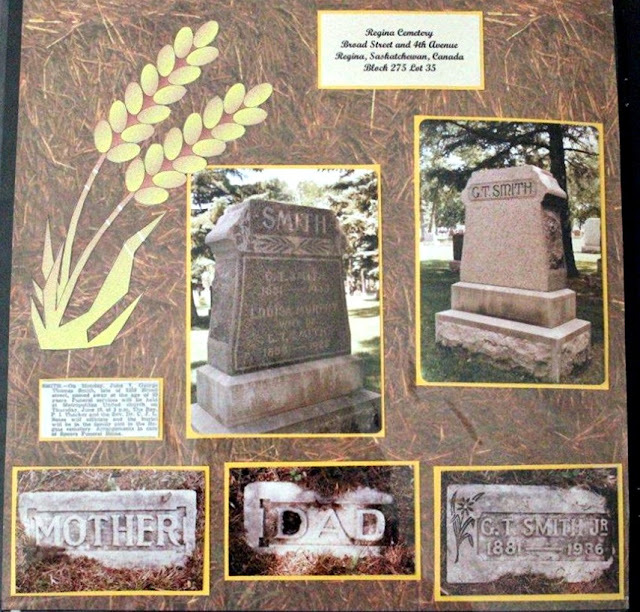 Since these photos were taken, the 'Mother' and 'Dad' markers have disappeared, and George Jr's marker is partially buried, and hard to find. And so I've come to the end of George's story without getting any closer to discovering his secrets. But as I move on to learn more about other family members, I'll still be on the lookout for anything else that pops us about George. Having spent a lot of time with him, I feel that I've come to know him rather well, and I'm certainly never going to forget him. 1) For instance, the reference to George having served in the Royal Marines is the only suggestion anywhere about this, and I can't help wondering who told the author that story. His daughters remembered him as someone who loved the sea, but that's as close as I've come to finding any seafaring adventures in his past. Also, George never lived at Stratford or Collingwood Ontario, although the name Collingwood was used to refer to the general area where he lived. And George and Louisa were married in England, not Ontario. 2) This information came from my cousin Donna, who wasn't sure how much money George left, or whether he still owned any land when he died. I'm currently hunting for George's will in the depths of the Saskatchewan court system, which may take some time. My mother's family settled in Saskatchewan, Canada, having come mainly from England and Germany via New England. I've been researching them for a few years, and have come upon several interesting, and unanswered, questions. Some of the surnames that are currently throwing up questions are Bates, Cockram/Smith, Covert, McConnell, Tower and Wanamaker. No doubt more will arise. I'm hoping that blogging/brainstorming about them will help me find new angles and ideas for research that will lead to answers. If you have a connection to any of my family lines, I'd love to hear from you - especially if you're also working on, or have already solved any of my mysteries! Please email me and hopefully we can help each other. A New Idea about George! George gets to Canada, at last! Copyright 2015 Linda Stack-Hawkley. Watermark theme. Powered by Blogger.